August marks the beginning of a very auspicious period. Starting from this month, there is a long line-up of festivals dotting our calendar. Gowri, Krishna, Ganesha, all the Gods are waiting to visit us! In such times, food demands a lot of our attention because in our culture food is an integral part of worship and festivity. Whether it is a range of modaks and ladoos to celebrate the Ganpati Utsav, or faraali recipes like K Kand Aloo Pakoda and Sabudana Vada Stuffed with Coconut Chutney to keep you going during the fasts observed in Shravan, or Malayali delicacies like Upperi, Paal Payasam and Ginger Pachdi to celebrate Onam, you need to focus on the foods that boost the spirit of each festival. In August, the monsoon is also upon us, and our palate yearns for steamy, spicy foods to warm our soul. Timeless treats like Roasted Corn On The Cob enjoyed in the company of good friends, or Kaanda Bhajji Pav and Moong-Dal-Pakoda enjoyed on the Mumbai roadsides, huddled under an umbrella, the right foods have the power to comfort us and instill a lot of positivity during the monsoon months! On a wet Sunday afternoon, when you do not feel like going out, make some yummy Batata Vada and enjoy it with your family, along with piping hot cups of Masala Chai Or Masala Tea. There is no better way to foster relationships! When you stride along the marketplace in August, you are greeted by the vibrant reddish, purplish, pinkish shades of plums and peaches! Although many fruits are available round the year these days, seasonal fruits always taste the best. The aroma of peaches is so tempting that you just cannot walk by without purchasing some, and so is the appetizing appearance of plums. So, when you come back home loaded with these tangy and tasty fruits and wonder what to do with them, look up our recipes to make yummy sorbets, Plum Parfait Plum Stew with Vanilla Ice-cream. The Peach Halwa, with its pleasing colour and mouth-watering flavor, is also a nice mithai to include in your festive menu. 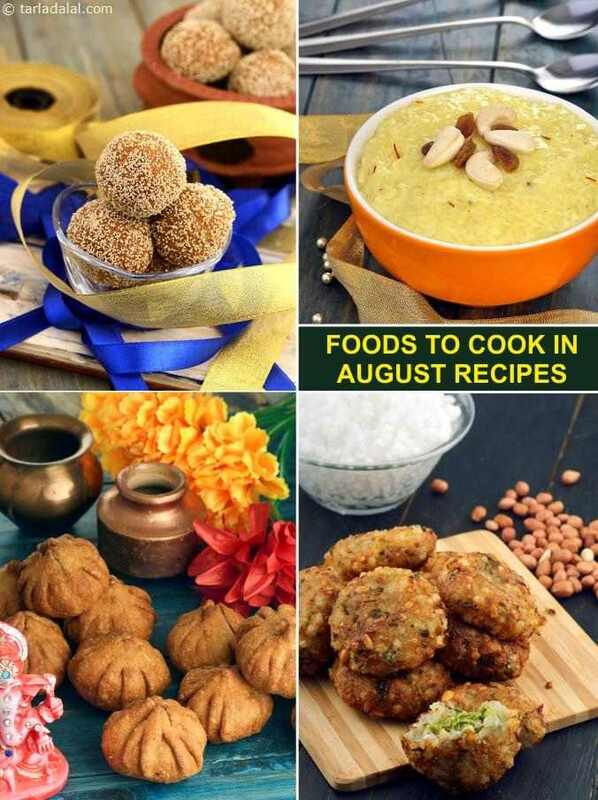 In the culinary world, August is an exciting month, and through this collection of recipes for Ganesh Chaturthi Recipes, Onam Recipes and Shravan, we hope to make it equally exciting for you. Armed with lots of exciting recipes to keep your spirits up in the monsoon, and delicacies with seasonal fruits like plums and peaches, you are sure to enjoy August thoroughly! The perfect preparation of puran poli is considered a highly-skilled task… an art actually! unlike Maharashtrian puran poli which uses chana dal, the gujarati version makes use of toovar dal. Its unique flavour and characteristic aroma can be attributed to the special Indian spices used. Kannda bhajji pav, the mumbaiite is no stranger to 'kanda bhajia'. You must try it too! thinly-sliced onions are flavoured with spices and deep-fried in hot oil. You can serve six to eight bhajjis per plate, either as is, or sandwiched between a sliced pav! must be had piping hot!